On subjects from Superman to rock 'n' roll, from Donald Duck to the TV news, from soap operas and romance novels to the use of double speak in advertising, these lively essays offer students of contemporary media a comprehensive counterstatement to the conservatism that has been ascendant since the seventies in American politics and cultural criticism. 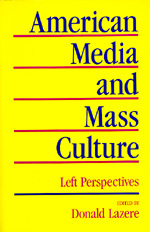 Donald Lazere brings together selections from nearly forty of the most prominent Marxist, feminist, and other leftist critics of American mass culture-from a dozen academic disciplines and fields of media activism. The collection will appeal to a wide range of students, scholars, and general readers. Donald Lazere is Professor of English at California Polytechnic State University, San Luis Obispo and author of The Unique Creation of Albert Camus.